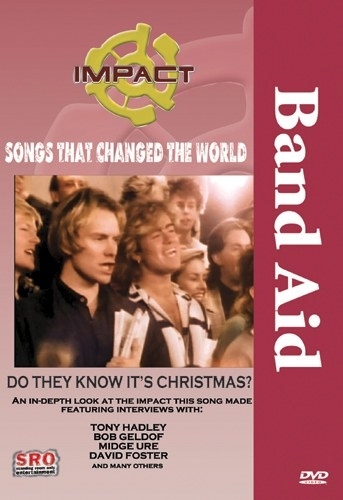 From The Impact Series, Songs That Changed The World - featuring Band Aid: Do They Know It's Christmas? was the single that gave birth to Live Aid, the world's biggest rock concert and TV event. It was, in many ways, the music world's finest hour as many of the biggest names in British popular music gathered in the summer of 1985 for the sake of charity to record a song to raise money for the starving in Ethiopia. Organized by Bob Geldof, the singer for the British group The Boomtown Rats, the single Do They Know It's Christmas, gave birth to Live Aid, the world's biggest rock concert and TV event which spanned two continents. The project would become the template and the inspiration for a number of other charitable recordings and live events to benefit various causes around the world and marked a new era of raised social consciousness for many entertainers as well as their fans.